05/17/2009- The Editorial Index Page and Editorials have been moved to 50 Webs! Various TaleSpin Places! !- Here's a list of all the places in the TaleSpin world from the Television Series, the Comics and even various fanfics. UPDATED WHEN NEEDED! The Impact It Has: Characterization - Alyson Terry's editorial on the impact of characterization on the show we all love. It is very long and well thought out. READ THIS ONE BEFORE ANY OTHER!! Speaking Without Words: Setting - This editorial written by Alyson Terry talks about the importance of settings in the TaleSpin World. TaleSpin Edits- This is an HTML file containing a huge compilation list of all the TaleSpin edits done by the Walt Disney Company. These are the sences (or just a sample of sences; as this file will be updated often.) that the Walt Disney Company doesn't want you to see. UPDATED WHEN NEEDED!! Why Tale Spin?- I know that Darkwing Duck and Gargoyles are very popular animated series; so why would I pick the most underrated and one of the least popular productions ever created by Disney. This is the first Tale Spin editorial. 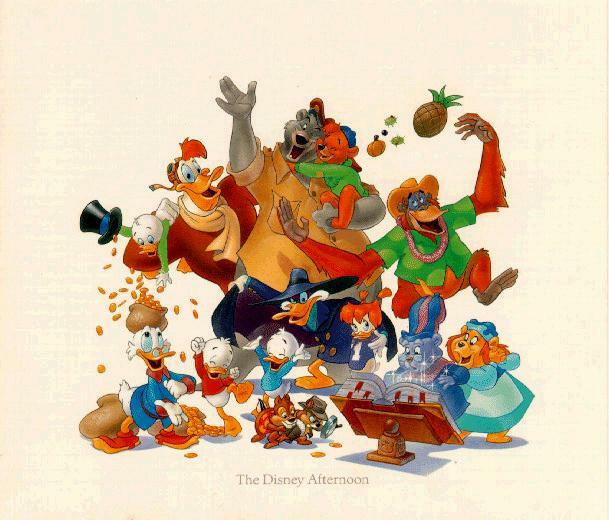 My Disney's Posse Didn't Do Their Homework!- Why did Tale Spin fail to attract the public? This editorial deals with one of the most dreaded words in the media. You may not like it; but you couldn't live without it. (A production that is!) I also give suggestions on how Disney should market their animated series by looking into the realm of Japanese anime. The Burning Questions: 10 Things I would like to see in Tale Spin. If I were a Disney Producer and I was given the right to run the table on what I would love to see if Tale Spin did in fact run another season. Remember that this is just a sample of what some fans would love to see. Please note that some of this will appear in my fanfics whenever they are put on-line. The Mission Statement: I created this website for more than just because I love Kit Cloudkicker. I did it to send a message to other Tale Spin fans. UPDATED WHEN NEEDED! Happy Birthday TaleSpin? : Kristof 's look of Tale Spin as Plunder and Lightning celebrates its eighth birthday. This editorial covers a theory that will make Tale Spin fans think twice about the original premise of Tale Spin and a series that was a combination of what Disney can do; and a major Disney mistake that some believe they haven't turely recovered from. Christopher L. Stone: An Unsung Hero in Tale Spin. My focus is on the person who composed Tale Spin and the importance of music in an animated series. This is my show of thanks to Jeffrey Mika "Heron" (who is a big Christopher L. Stone fan) for sending me all that beautiful artwork for this website. UPDATED WHEN NEEDED! Jymn Magon's Spin on Kit Cloudkicker and Tale Spin: Recently; Jymn Magon visited the Unofficial Kit Cloudkicker Homepage and gave me a bit of a teaser on how he modelled Kit Cloudkicker and some of the spirit that we know as Tale Spin. This is a follow-up to the Kit Cloudkicker Profile/Editorial. Kit Cloudkicker: Young Jedi - Written by Dan Green. Dan talks about Kit Cloudkicker's relationship with Luke Skywalker. The relationships will surprise you. 40 Useless Facts of TaleSpin - This short essay is pretty much explains itself very well. It is now onsite because Aces of the Cape was looking for a new home on my last visit. Disney's Fox & Family Devalued - This is without a doubt the worst rant fit that I have ever done about Disney. It includes graphic dialogue on the tv ratings; religion; the word 'aquire'; and one good take on why Disney is *NOT LIKE NINTENDO*! It's All About School (Cartoons) - Here's another _Aces of the Cape_ editorial that I did for Jim Baylo. Naturally; it is a small rebutal to Jim Baylo's noble opinion on school cartoons and why I think the cartoon compaines have killed a genre that was quite a bit refreshing in the art of animation. Disney's Exercise In Scarying Uneducated Television Critics- When you see a headline like this...you know something is wrong...It's a couple of months late; however, it might just apply to future Disney releases anyway. Another editorial for Aces of the Cape. What On Limbo's Dance Happened to Writing- It's amazing what editorial goodies can be found in the Christan Science Monitor. An article on reading inspires this writer to write an editorial on something that might have avoided all those messes in 2000. A powerful editorial with some background to my life and my reasons for getting into writing. The truth starts now!! What's Inside the DirtBox?- Disney is safe for now......There is no way that I'm going to place the word FOX in the same breath as this really bad block of children's programming. This kind of television is the reason why Disney has never made many quality products over the years. Also; if this the future of Anime: I wish it went back to Japan. FIGHTING FOODOMS?! I talk about previews, commericalization, wrestling and two characters who I feel very sorry for right now. Time to take out the trash!! Kim Possible Does The Impossible & Other Things- Pass the TaleSpin Standard of course. However; the question remains. Why did it take so bloody long? I attempt to answer that and Darkwing Duck fans are not going to like what I'm going to say. Also; an update on my favorite whipping boy and tackling the subject of Freedom Fries. American Wraith at its finest!! Lost Episodes and Kingdom Heart- My first TaleSpin editorial in almost a year now; I think... I decide to think about something that bothered me while I was surfing the web. Plus; I respond to the talk about TaleSpin being used for a possible Kingdom Hearts sequel and why TaleSpin is much closer to Final Fantasy than even I thought it was. Cloudkicker Simpson- This is another TaleSpin editorial which will answer the question. Is Stormy Weather a rip-off of The Simpson's Daredevil Bart? This editorial is a compare and contrast that teaches a lesson about dealing with so-called rip-offs...Longest editorial I ever wrote! The Dirtbox Meets The Sandbox- What in the world could I say about 4Kids lousy children's programming block? Well; if thing do the way they do; the FoxBox might actually have a hope chest...Read on for my preview of the 2003-2004 edition of the FoxBox. What I Want For My Birthday Is D-V-D! - Here is my take on a growing problem that has only one solution. Are you listening Disney? Dive into my mind as I sort out a solution to everyone's TaleSpin problem..
My Favorite Episodes- Think about it this way besides being a bonus editorial:This is pretty self-explaining yes-no? The Allagory of WDTVA: Why Is Must Be Defended & Shunned! - It's time to talk about the real cause of Disney's woes. I explain that Walt Disney is not all that he appears and why I think that Roy Disney's cause is noble; but dead in the water. Also included is a matchbox history of DTVA and a solution to the problem of diluation. Silly Fox! The FOXBOX Is Just 4Kids Part Deux - This is a preview of the FOXBOX Fall 2004 lineup. Click on the link to check out all four new shows (including the powerhouse that is ONE PIECE!) that will be released in the Fall of 2004. Plus a review on Martin Mysteries and the dreadful Incredible Crash Test Dummies which has now joined The John Henson Project as one of the top ten worst shows of all time. It's Weaglerific!! A One Piece For The Ages - Here is the follow up to my preview of the FOXBOX Fall 2004. My review on the first perfect score for the 4Kids block on boardcast television and my thoughts on the latest racing show. Plus; does the WINX Club meet my ulimatation or is it just another girl power show? Find out inside. The End of 4 Kids Dot TV - The exciting conclusion to an editorial series that has gone too far as usual. ..and it ends with a bang as the worst anime series has been found; if you consider it anime in the first place! Hey!! The Sox Win The Series - 18 years of heartache and lust; now this media creation is falling apart. The Sox Win The Series; The Total Eclipse of the Heart!...Read on to see why this bastardized song has an important meaning. Stop Being Such Girly Men!! - Is feminism ruining boys all over the world?! No; but this issue has now poured into animation and this editorial is a reminder to all who read it that it does take time and heart to write something that won't be just another shout in the wind. This editorial contains some sarcasm and also contains someone getting what they deserve for making a fuss over an issue no one cares about. The Agony of Cartooning: The Fifty Worst Cartoons I Have Ever Seen!- I don't think I need to explain any further. One Year of Cloudkicking - My editorial about my first year as a webmaster and also some rambles about Teddy's rant on Disney plugs and why I'm obessed with the series. Two Years of Cloudkicking - This Editorial is for the second year of the Kit Cloudkicker Homepage and this time I rant about the 'Unforseen Impact' of the TaleSpin on people and why its time for the entertainment industry to take notice. Three Years of Cloudkicking - This editorial is for the third year of the Kit Cloudkicker Homepage's existance and this time; it all about comebacks. Four Years of Cloudkicking - This editorial was made during my problems with my browser; so there was little to talk about. Although I admit; the lack of good animation this year helped that cause a lot. Five Years of Cludkicking - This is the biggest moment for this website as I'm celebrating five years on the web. So it's time that I stopped talking and let the TaleSpinners out there talk about my website. Six Years of Cloudkicking - Another year of Cloudkicking has arrived and surpassed. I don't have much to talk about this year; so I'm going to just address the releases and then talk about Nintendo DS. That should prove that I really don't have much to talk about this year. Seven Years of Cloudkicking - Another year of Cloudkicking has arrived and surpassed. I don't have much to talk about this year since the Big N won't talk about a revolution. So; I'll create a revolution of my own: The revolution of voice talents working on videogames. Eight Years of Cloudkicking - Another year of Cloudkicking has arrived and surpassed. I promised to give my thoughts on Wii; but I only need one word to describe it: Awesome!! Click on the link to see the reason why it is awesome and why sometimes acting like you know what you are talking about when you don't can be fun as those fake blogs on Wii demonstrated. The Final Cloudkicking Address - Yay! My website turns ten years old. However; anyone expecting a big party bash out of this better be prepared to be disappointed big time. I explain more as this site is finally put into retirement. 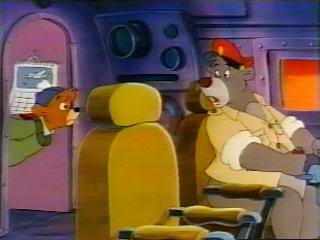 TaleSpin - Click here to see the reviews for all 65 episodes of TaleSpin. Kit Cloudkicker Profile/Editorial- It just wouldn't be a Kit Cloudkicker Home Page without a profile about the best child furry in animation. It is not just any profile; this is the story of a character who captured my heart and soul for the last five years. I cover why he is so complex; and his symbolism in Tale Spin. Kit fans should not miss this! Rebecca Cunningham Profile/Editorial- A profile on Rebecca Cunningham; she is the most instrumental in convincing Kit Cloudkicker to stay at Higher for Hire. My small look on one of Disney's best female characters. Molly Cunningham Profile/Editorial- A profile on Rebecca's young daughter Molly Cunningham. Yes; she is an annoying character! However; TaleSpin would never be the same without her. My spin on one of Disney's greatest "Filler" characters. Baloo Bear Profile/Editorial - A profile on the original star of TaleSpin Baloo. This editorial takes a look of why Baloo is different from the other spin-off characters that existed in Walt Disney Television Animation. And why Baloo and Kit must be together. Frank WildCat Profile/Editorial - A profile on Baloo's partner in TaleSpin. This editorial attempts to explain the power of a paradox and why WildCat's paradox makes him the most underestimated character in all of TaleSpin! Return to the Unofficial Kit Cloudkicker Homepage!! Disclaimer: All images and material represented here are (C) 1990/1991 Walt Disney Company and are being used without premission. The webmaster has assured that no money was made in the creation of this webpage and all material represented are being used with the upmost affection and respect to the Walt Disney Company and the Tale Spin team. Special Thanks to 50 Webs for providing space for this webpage. Click here to find out how you can get your free homepage and 60 Megabytes of webspace.